Very few places in the world can match Krabi, in terms of quality, quantity, and variety of natural attractions. In Krabi one can enjoy tranquil ocean panoramas, magnificent caves, majestic mountains, spectacular waterfalls, and lush tropical forests all in one day, and in many cases, one place. Located approximately 20 km from Krabi, this peaceful national park covers nearly 50 sq km of lush forest, and is home to over 150 species of birds and 32 species of mammals, including the Malayan sun bear, the Asiatic black bear, and the clouded leopard. Tiger tracks have also been reported in the area. The highest peak in the park, Khao Phanom Bencha, rises 1350 m, and is the highest point in the province. In addition, several wonderful waterfalls and caves containing vast quantities of stalagmites and stalactites are located within the park. Khao Phanom Bencha is accessible by songthaew, and guided eco-tours are available from some of the hotels and guesthouses. Huai Dto Waterfall: This magnificent, 11-tiered waterfall is one of the feature attractions at Khao Phanom Bencha National Park. Located only some 500 m from the park office, this waterfall is strikingly beautiful, and by far the most visited place in the park. Huai Sa-de Waterfall: This waterfall, located about 1.2 km from the park office is smaller than Huai Dto, but also quite beautiful. Huai Sa-de Waterfall runs off a high cliff, and is a wonderful place to take pictures. Khlong Haeng Waterfall: This waterfall is over 500 m high, and flows down Khao Phanom Bencha, the highest peak in Krabi. Ton Han Waterfall: Smaller than Khlong Haeng Waterfall, Ton Han also springs forth from Khao Phanom Bencha, although from a lower location. Khao Pheung Cave: Located some 3 km from the park office is Khao Pheung cave, which boasts a plethora of stalagmites and stalactites of different sizes and shapes. The inside of this cave is white, and shimmers with mineral deposits. This national park, covering over 121 sq km is situated in Ao Luk, approximately 45 km from Krabi. A truly beautiful, and well-preserved area, Than Bokkhorani has countless natural attractions, ranging from limestone mountains to mangrove forests. In addition, some of the most impressive caves in Thailand are located here, full of gorgeous stalagmites and stalactites. 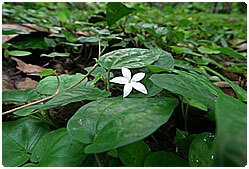 There are also a large number of small waterfalls hidden within the emerald-green forests. Than Bokkhorani can be reached from Krabi by bus or hired car. Than Bokkhorani: This is one of the more peaceful places in the region. Set deep within a lush green forest, Than Bokkhorani is a natural forest pool created by the convergence of several, small, natural streams. These streams run together at several different levels, creating many delightful, small waterfalls. 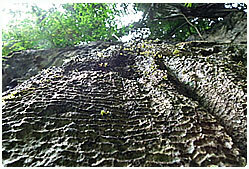 Near the pool is a beautiful copy of the Buddha's footprint carved out of wood. Tham Lot: This incredible limestone cave contains some of the most spectacular stalagmites and stalactites in the area, and extends into a labyrinth of wandering passages, which are navigable during low tide. This cave can be reached by boat from the Bho To pier in Ao Luk. Tham Hua Kalok: This cave, situated in close proximity to Tham Lot, is known for its pre-historic paintings. Tham Hua Kalok is split into two main sections, accessible by a single entrance. The left section is a larger cavern lit by a small opening in the top. The right section is an open hall, which many believe was once the dwelling of pre-historic peoples. Inside the right section there are over 70 rock paintings portraying both people and animals. Also found in the cave were several large skulls, and a large pile of shells. This cave is along the same route as Tham Lot, and can be reached by boat from Bho To pier. Tham Phet: Tham Phet, or Diamond Cave, is another remarkable cave located in Than Bokkhorani National Park. This cave derives its name from its shimmering rock walls, which reflect light. Tham Phet can be reached via the National Park Office at Tham Bokkhorani, where guides can be arranged. Tham Song Phi Nong: This cave is located just west of Tham Hua Kalok, and contains several ancient artifacts, including skeletal remains, pottery, earrings, and bronze tools. Tham Pranang Nok is the most famous cave in the area, and set on the stunning Pranang Peninsula, certainly one of the most beautiful. According to Thai mythology, during the time of Alexander the Great, a royal ship carrying an Indian princess named Srikulatavee sank offshore. Pranang cave is supposedly where her soul dwells since it was never properly laid to rest. Inside the cave there is a shrine to the spirit of Srikulatavee, where fisherman place offerings in request for a plentiful catch. This wonderful cave can be reached by boat from the Chao Fah jetty in Krabi, for a fee of 40 baht. This gorgeous, three-tiered waterfall is located in the Ban Hin Peung section of Khlong Thom. 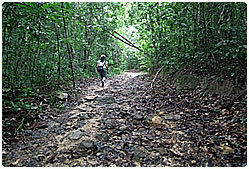 Set deep in the forest, Hin Peung is well shaded, and runs down a steep rock face. Some hiking is necessary to reach this waterfall, but it is well worth the trip. These two gigantic limestone outcroppings are an imposing, natural gateway to Krabi. Rising directly out of the water to a towering height of over 100 m, these two gigantic karsts usher visitors into the town, and are an enduring symbol of the area. In addition, Khao Khanap Nam houses several caves with impressive clusters of stalagmites and stalactites. These caves can be reached via a waterside stairway. Khao Khanap Nam is accessible by boat from the Chao Fah Bridge in Krabi, for a nominal fee. This 170 square-acre wildlife preserve is located in the Khlong Thom section, and is home to two wonderful wildlife attractions, Thung Tieo Forest, and Sa Nam Phu. 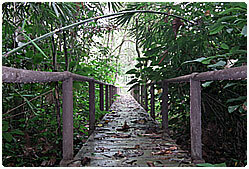 Thung Tieo Forest is a naturally preserved rainforest, with an abundance of wildlife, particularly rare birds. A 2.7-km trail runs through the preserve, offering some spectacular views of this virgin territory. Also located within the preserve is Sa Nam Phu, an extremely deep jungle pool. Located on the Pranang Peninsula is Sa Pranang, a spectacular, aquamarine lagoon tucked into the side of a tall limestone cliff. This unique and breathtaking location can be reached by way of a steep cave path on the Pranang Peninsula. Guides are available from guesthouses and hotels, and the hike takes about 45 minutes. Located at Ban Laem Pho, 17 km from the town of Krabi, is Su San Hoi, an enormous deposit of fossilized shells, nearly 40 cm thick, and reputed to be over 40 million years old. At one point this area was a freshwater haven for pond snails and other crustaceans, whose remains were fossilized into shelly limestone. One of the more significant geological sites in the region, Su San Hoi can be reached by songthaew from Krabi. This cave, only recently discovered, is larger than Tham Pranang Nok, and is composed of three large caverns. Inside these caverns are some of the most spectacular limestone formations, including a "waterfall" of crystalline quartz. The entrance to this cave is located on East Rai Le.